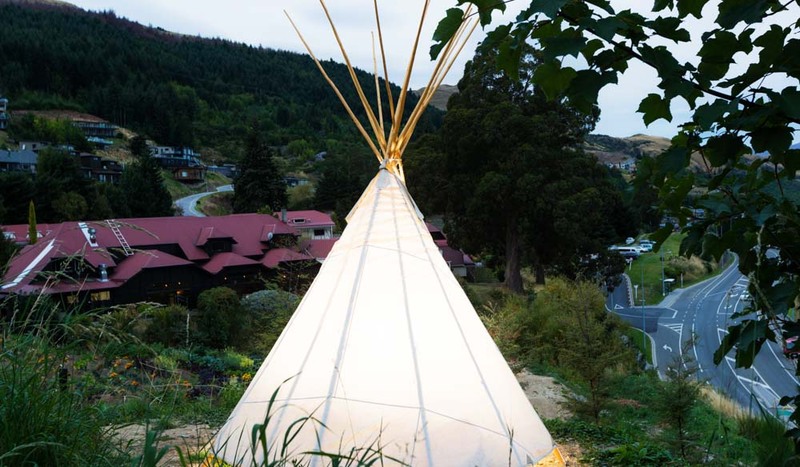 A teepee nested in the grounds around the hotel (photo: Vaughan Brookfield). 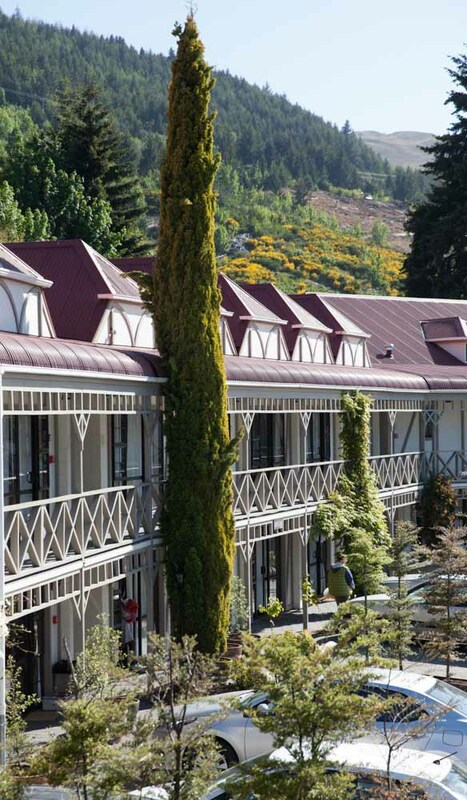 The mock-Tudor trim of Sherwood, Queenstown (photo: Vaughan Brookfield). The cloth lamps and low beams of the dining room. (photo: Vaughan Brookfield). Views take in the Remarkables and Lake Wakatipu (photo: Vaughan Brookfield). The rooms are comfortable, with quirky upcycled pieces throughout (photo: Vaughan Brookfield). On an anniversary road trip around New Zealand’s South Island, Serena Renner and her husband find their home away from home. Driving into Queenstown on the autumn evening of our one-year anniversary, my husband and I miss the turn-off for the Sherwood hotel. It takes a few passes to realise the ‘BE HERE NOW’ sign, painted in primary colours, is directed at us. 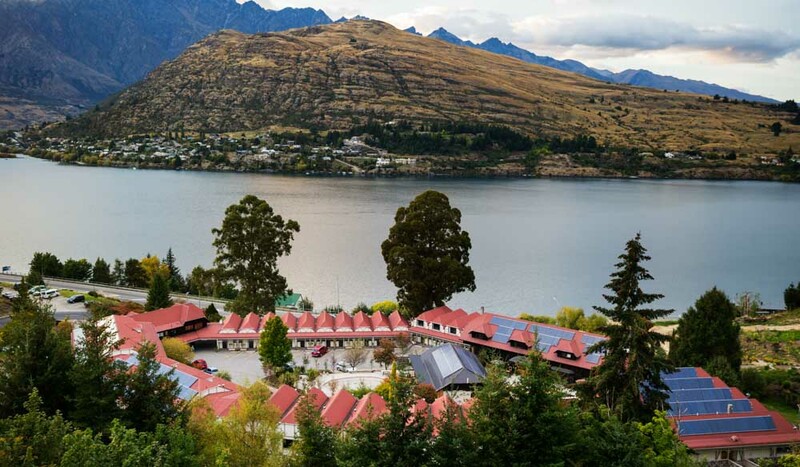 Opened in November 2014, the place looks more like a 1980s motel in Denmark than a reservation, but views of the snow-capped Remarkables mountain range and Lake Wakatipu below hint at the sign’s meaning. A quick stroll around the property unhinges my Danish motel theory: I see solar panels, LED string lights, kilim cushions and a fire pit. 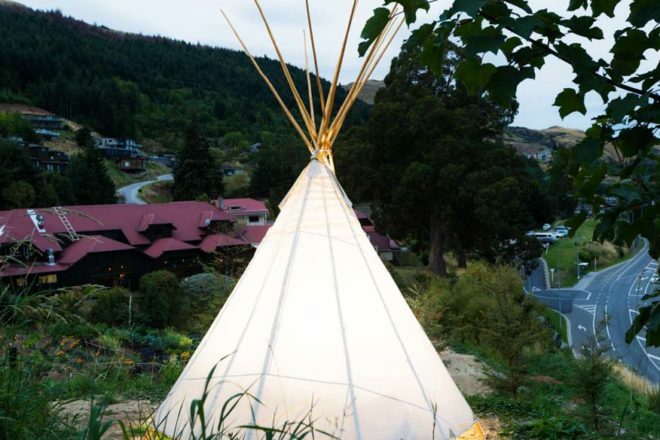 Beyond the restaurant a colour-splashed hillside of flowers and produce blooms all the way to a teepee, encircled by a dirt path for mountain biking in summer or slalom skiing in winter. 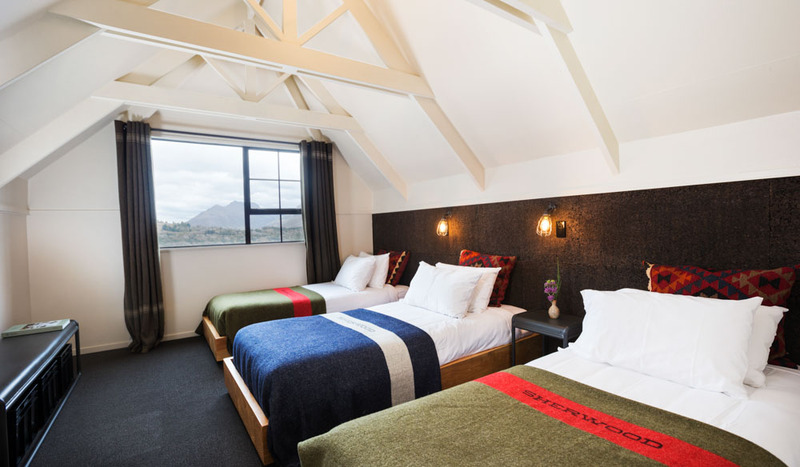 I concede that Sherwood is New Zealand’s answer to the USA’s cool Ace Hotel collection, except more outdoorsy and wholesome, and with a way better view. We quickly drop our bags in our standard king room – which upholds my Ace stereotype with its upcycled black-and-white interior, industrial pendant lamp, local artwork and Pendleton-style wool blanket – and head to dinner. There’s a wait, despite having made a booking, so we grab stools at the long central bar and scan the list of natural wines and craft beers. We settle on the funky Clockwork Orange from Mount Edward Winery and the Maximus IPA from Hallertau Brewery in Auckland, which my husband soon declares “the best beer in the southern hemisphere”. 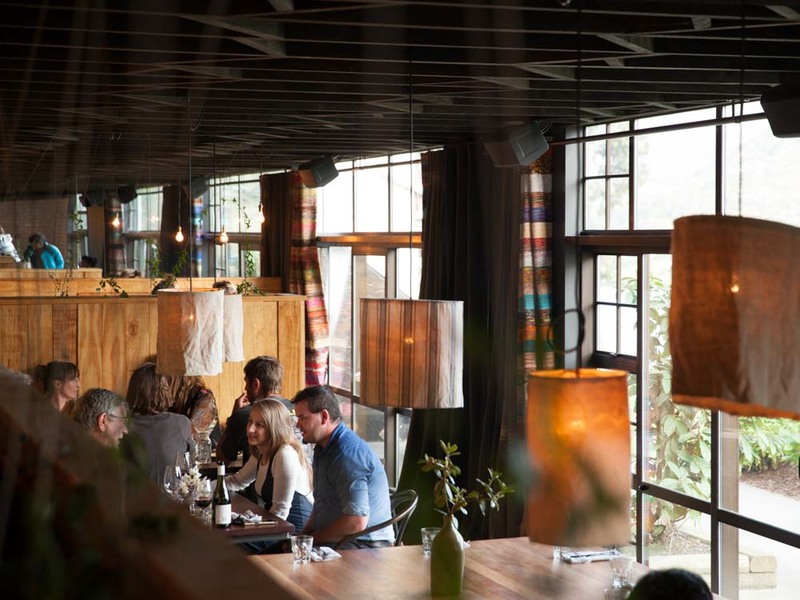 The space is intimate, with dark, low-hanging beams in contrast to the blond wood and white tiles. In the sunken dining room, cloth lamps dangle and couples relax against sheepskin while they watch the setting sun shimmer across the lake. Be here now indeed. Our seats at the open kitchen are worth the wait: we have a front-row view of head chef Ainsley Rose Thompson, as well as whatever local fish or meat is sizzling on the Big Green Egg barbecue, which looks like R2-D2 encased in a giant lime. With the help of our tattooed Scottish waiter, we order potatoes with black garlic; a salad starring local figs and rocket from Sherwood’s kitchen garden – which supplies 50 per cent of the restaurant’s greens and herbs; pan-fried sole that would have been bycatch; and a New Zealand specialty: green-lipped mussels in a white wine butter sauce. “You can’t even put something like that into words,” our waiter says. He’s right. Everything from the sole’s crunchy skin to the homemade bread we use to soak up the mussel juice leaves us speechless. After dinner we retreat to the far end of the bar, which is decked out in red velvet drapes, to check out the DJ. We like what we hear, but the small crowd doesn’t energise us quite enough to outweigh our comfy bed. It is our anniversary after all. The next morning, I take a $15 yoga class in Sherwood’s attic studio, and finish feeling fresh, despite too many orange wines the night before. It must be all the great sleep and nourishing food. The restaurant calls me back for a coffee, and I spot the short, black hair and rimmed glasses of chef Thompson. I compliment her on our dinner and ask about her background. She graciously maps out her cooking history from Matterhorn Restaurant in Wellington, where she worked under Sherwood’s co-owner Sam Chapman, to Hapuku Lodge near Kaikoura and The French Café in Auckland. After The French Café, she underwent a “wellness revolution”, during which she cut out sugar, dairy and gluten and committed to scratch cooking and using unrefined ingredients, she explains. “My vision for the restaurant is the same as the vision for the whole place,” Thompson says of Sherwood. I realise that must be why I feel so comfortable: my values fit Sherwood’s values, too. There’s no place I’d rather be than here. The IT Verdict: Soulful and sustainable, Sherwood is perfect for design-savvy travellers looking to tap into a conscious community. Location: 9 / 10: Far enough from the city to be quiet (and have uninterrupted views), but a quick drive to the lake, mountains and businesses. Style / character: 9 / 10: Beneath the mock-Tudor trim and red awnings is a hipster haven that’s as beautiful as it is quirky. Service: 8 / 10: A dinner reservation didn’t reduce the wait, but our server went above and beyond to compensate. Rooms: 8 / 10: Simple but comfortable, featuring fast wi-fi and eco-minded touches from cork to repurposed curtains. Food and drink: 10 / 10: Local, organic, and striving to achieve zero waste, the dishes and drinks are a highlight. Value for money: 8 / 10: You may not find a TV, but there’s a whole lot more to discover; from $230 for a Terrace King room with a minimum two-night stay.